For the third time in a row Eric Clapton experienced issues with the recording of a new album. In 1980 RSO rejected the Glyn Johns produced “Turn Up Down” prompting Clapton to enlist the assistance of Tom Dowd in recording a new album in Nassau, in 1982 Clapton terminated his association with his regular touring band when work progressed in an unsatisfactory manner during the recording of MONEY AND CIGARETTES and in 1984 Warner Brothers rejected the original version of BEHIND THE SUN which resulted in a compromise solution involving Clapton journeying to Los Angeles to record material submitted by Texas songwriter Jerry Williams. Expectations for the new album had been fairly high. There was evidence that Clapton’s playing had regained an edge as initially demonstrated during his 1983 tour in support of MONEY AND CIGARETTES and then further evidenced during the 1983-1984 A.R.M.S. concerts and his session work on Roger Water’s album THE PROS AND CONS OF HITCHHIKING”. Clapton was not abusing alcohol at the time and had written excellent material based upon his troubled relationship with Pattie. He was also experimenting with a Roland guitar synthesizer which was indicative, along with his choice of Phil Collins as producer, of his intention for a contemporaneous recorded sound. Collaborators selected for the album were impressive. From time to time, Clapton would look to shake up musical stagnation by collaborating with different musicians or producers. Despite the absence of second guitarist/keyboardist Albert Lee, the collective musicians for BEHIND THE SUN had impeccable credentials. Bassist Donald “Duck” Dunn was truly an R & B legend and Clapton alumni such as Jamie Oldaker (rated as one of Clapton’s best drummers) Marcy Levy were welcomed back into the fold. Keyboardists Chris Stainton and J. Peter Robinson along with percussionist Ray Cooper (of A.R.M.S. concert fame) rounded out the group. Sessions at Montserrat apparently progressed quite well and the completed album was pleasing to Clapton, Collins, and Clapton’s manager Roger Forrester. However, Warner Brothers was concerned about lack of commercially viable material which could be promoted as singles. Clapton demonstrated a high degree of maturity and objectivity when he subsequently challenged Warners Brothers to come up with what they deemed to be suitable material and then convinced them to produce the new sessions. Those L.A. sessions featured “A” list players such as guitarists Lindsay Buckingham (Fleetwood Mac) and Steve Lukather (Toto) drummer Jeff Porcaro (Toto) keyboardist Greg Phillinganes (currently a member of Toto) and bassist Nathan East. Clapton liked the material offered by Jerry Lynn Williams and established a strong rapport with the Texas songwriter who would contribute songs to future Clapton projects. With such a troubled foundation, one might expect the album to be mismatch of styles and musical focus. To tell the truth, the album does have somewhat of a schizophrenia quality about it with the combination of the Montserrat and Los Angeles sessions. That said, this is a very good album with strong material and features some of Clapton’s best recorded guitar solos in many years. Phil Collins production is actually very impressive although I understand that many fans regard this album, as well as AUGUST, as being less than stellar moments in Clapton’s career. I have always regarded that viewpoint as unfair and although I agree that AUGUST does seem to feature a dated sound that links it to the mid 1980’s, BEHIND THE SUN has passed the test of time. 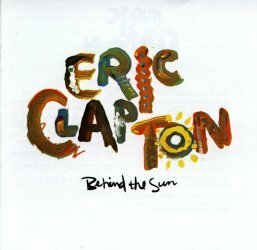 It is important to note that BEHIND THE SUN was the first Clapton album to feature synthesizers and their usage was extremely tasteful and appropriate to the material. That should serve as a testament to the quality of Collin’s production values as well as the playing of Chris Stainton and J. Peter Robinson. This is all the more impressive when considering that some reports from 1984 indicate that Clapton was not always pleased with the on-stage balance of synthesizer application and volume. Clapton’s original compositions provide insight and detail concerning his marriage with Pattie and several of the compositions from Jerry Lynn Williams were very good. Add to the mix a catchy song contributed by Marcy Levy/Richard Feldman (“Tangled In Love”) and a R & B classic such as “Knock On Wood” and you have a basis for a fine record. Some of the material deleted from the original sessions, “Too Bad” and “Heaven Is One Step Away”, can be found on the excellent 1988 box set called CROSSROADS. Both are good songs which would have fit well on BEHIND THE SUN. It would be fun if some future deluxe edition of this album could be released with all the restored material. “Forever Man” and “See What Love Can Do” are the best of the Williams material and both feature excellent vocals and guitar by Clapton. “Forever Man” was selected as the first single and is also noteworthy as being Clapton’s first musical video. Clapton did not give the impression that he was comfortable performing “Forever Man” in a live setting and it was not a regularly featured stage song during his 1985 U.S. Tour to promote BEHIND THE SUN. Listening to one version of the song from that tour seems to confirm his reservation as the studio version with its impassioned vocals and fiery yet concise solo was far superior. Surprisingly, “Forever Man” was one of the featured songs during Clapton and Steve Winwood’s February 2008 Madison Square Garden concerts. Clapton’s original material, with the exception of the meandering “It All Depends”, is very good. “She’s Waiting” (co-written by Robinson) may be the best of the lot and was the only new song featured at Clapton’s 1985 Live Aid performance. The romantic ballad “Never Make You Cry”, is musically reminiscent of “To Make Somebody Happy” from CROSSROADS II and “Another Ticket” from ANOTHER TICKET and features a beautiful guitar synthesizer solo. “Same Old Blues” and “Just Like A Prisoner” are great songs which also feature some of Clapton’s best recorded solos. His playing on both songs is inspired and aggressive. At times it almost seems as though the other musicians struggle to keep pace with him, especially on “Just Like A Prisoner”. The haunting title track, featuring only Clapton and Collins, is the perfect coda to this album. The level of musicianship is impressive. Synthesizers & keyboards by Chris Stainton and J. Peter Robinson are prominent yet tasteful and the rhythm section of bassist Donald “Duck” Dunn and drummer Jamie Oldaker is first-rate. Additional percussion by Collins and Ray Cooper help to make this one of Clapton’s most rhythmically adventurous projects to date. Prominent backing vocals by Marcy Levy and Shaun Murphy complete the ensemble. This album is notable for reasons other than fine music. It marked Clapton’s introduction to material by Jerry Lynn Williams who would go on to contribute songs to the 1986 AUGUST and 1989 JOURNEYMAN sessions, it marked Clapton’s introduction to keyboardist Greg Phillinganes and bassist Nathan East who would appear with him both on record and stage for many years, it marked Clapton’s introduction to and subsequent affair with Yvonne Kelly which would result in the birth of a daughter named Ruth, and finally it marked Clapton’s relapse into alcohol abuse which would continue until he finally sought further treatment in 1988. BEHIND THE SUN is a much-maligned album which is deserving of a wider audience and further acclaim. I recommend it to both casual and serious fans. You cannot go wrong with an album featuring such strong tracks as “She’s Waiting, “See What Love Can Do”, “Same Old Blues”, “Forever Man”, and “Just Like A Prisoner”. A great album. EC finally departing the slow motion area of the seventies. The solo on Forever Man is a stunning killer with it's agressive bite and great timing!. This to me is a break out album. Eric at that point had, had a few sub par albums. This album starts out with " She's waiting", which is one of the stronger tracks of his career. He then does a version of "Same old Blues" which is one of the better blues performances of his career. He then does the Motown classic "Knock on Wood" which to me is very strong and worth the listen. It shows Eric's interest in Motown which up to this time you didn't see much of. Next is the classic "Forever Man" which also had a great MTV video to go with it. Its short and sweet, again a classic.Next is my personal favourite on the album "Tangled in Love" which show a driving guitar, with solos and all. This is the prelude to the classic "Journeyman" and a must for any true EC fan. He once again is not afraid to play and is not laid back as he had been on several recent CD's. I think this is a quite good album with great songs like Knock On Wood, Behind The Sun, and Forever Man, but I know E.C. personally and we both think songs like She's Waiting and Tangled in love are just a waste of recording space. However, it's well worth your money! I think this is E.C. 's best album, followed closely by Pilgrim. I'm not sure what it is about this album particularly, but it really is fantastic. I was immediately taken by She's Waiting, but I think the best track has to be It All Depends-it has a quiet air of inspiration to it that I love. This album is great good songs, good solos my faves: "Forever Man", "Same Old Blues", "Never Make You Cry" etc. Well done album! When this record first came out I thought I would hate it - Eric's blues-rock roots colliding with Phil Collin's mainstream 80's pop production values? Yeucchh! The results, however, are surprisingly fine. Its not a collision of the two artists' styles but instead a seamless blend. The record has a very bright, immediate sound, and the material ranges tantalizingly from gentle ballads to fierce blues workouts. Nice one Phil and Eric! This was the first of two albums produced by Phil Collins (the other being 'August'). The album has a great upbeat feel, even the slow songs have that bright feel. She's Waiting is the opening track, a great rock tune with a neat solo and a strong EC vocal. Forever Man has a fantastic lightning fast solo that shows EC's talent to the full. The song of the album is 'Same Old Blues', an 8 minute blues that has amazing guitar and vocal work, you can hear the emotion in EC's voice and guitar. This is a great album and is one of many must haves for any EC fan.